Btw, I will contact you soon about having you redraw the black and white version. 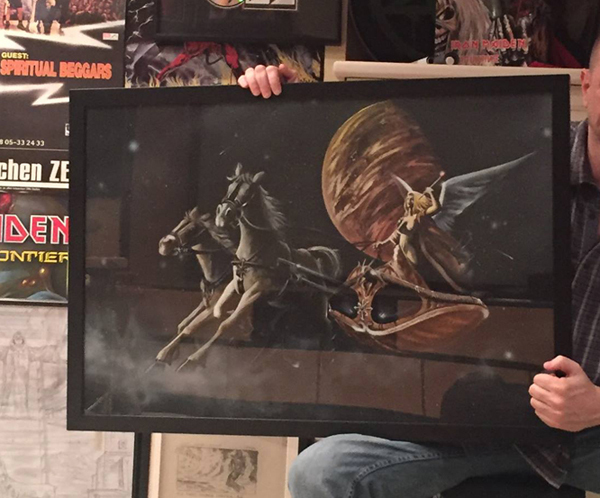 Funny, I've seen a photo of the original painting and the chariot on GOW is going in the wrong way ! I think they flipped the film when they scanned it. I can easily flip it the other way if needed but I kept it the same as before. Blasphemy in Australia - mini tour 2019. Ah hell, Blasphemy AND Vomitor? I never wanted to attend gigs as much as I want now. Yeah, Blasphemy and Vomitor...? That is going to be one sick show. That's one pairing for some serious debauchery hahaha! got my ticket the other day for Blasphemy & Vomitor, $66... Oh well, at least I won't get stuck sitting through a handful of Babushka songs like last year. We have a good run coming up - Blasphemy, Incantation and D666. Plus Crowbar as well, and as mentioned hopefully Dark Mofo will be able to top the greatness of last year's show. (Arms and chest I believe). The studio is mentioned on the FAOD 'thank list'. "Fallen Angel Of Doom" review from Buttfuck 'zine #4 - issue in English language. This whole issue was dedicated to the memory of Per Yngve "Dead" Ohlin of Mayhem. 7usd for a demo in 89-90!? Thats rough!